DID YOU KNOW? The Federal Communication Commission recommends keeping your cell phone 5 to 25 millimeters away from your body, depending on the model, to limit radio frequency exposure to safe levels. 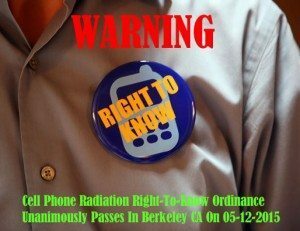 On May, 12, 2015 the city council in Berkeley, Calif. voted unanimously 9-0 on a Cell Phone Radiation Right-To-Know Ordinance that requires wireless retailers to warn customers of possible radiation exposure when purchasing cell phones. Cell phones sold in Berkeley will now come with a warning notice explaining the dangers of high radio frequency (RF) exposure. Berkeley is the first city in the nation to pass a cellphone radiation ordinance since San Francisco disbanded a similar ordinance after a two-year court battle with the CTIA. The law is expected to be passed, and when it does retailers in the city will have to warn customers that carrying a phone in a pocket or bra while it is on and connected to a wireless network could expose the user to excessive RF radiation. The only opposition to the ordinance came from the CTIA–The Wireless Association. The CTIA claims that consumers would be scared if they were directed to read the information that the FCC requires they provide to consumers. It’s also worth mentioning that the current FCC chairman was once the former CEO of the CTIA. 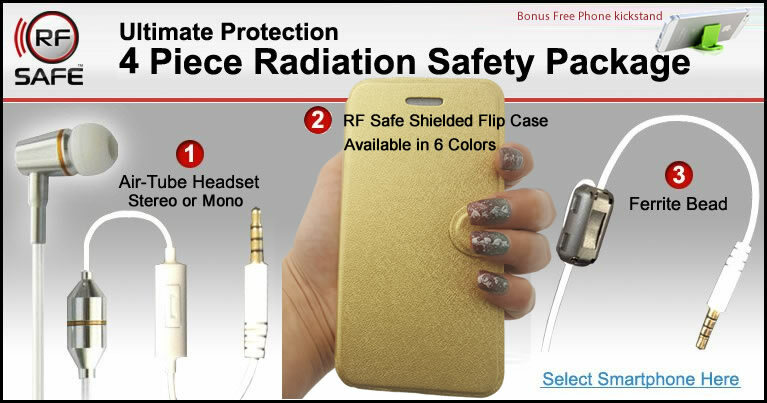 Cell phones emit radio frequency radiation that is absorbed by human tissue. Conclusive evidence that this type of radiation causes cancer is only one step away. The Interphone, Hardell and the recently concluded CERENAT studies have all pointed towards a common risk to increased brain cancer! Cell phone makers such as Apple recommend keeping your cell phone at least 5 to 10 mm away from your body to avoid excessive RF radiation exposure, but these warnings are often buried in phone manuals or deep in settings menus. FACT: In May of 2011, the WHO’s IARC panel classified cell phone radiation as a Class 2B Carcinogen. Lawmakers have attempted to institute similar ordinances in places such as Maine, Hawaii and New Mexico, but Berkeley would be the first place to actually pass such a law. In Berkeley, 82% of adults would like to know the recommended distance a phone should be kept from their bodies, according to a survey funded by the California Brain Tumor Association. Stats on this survey were submitted to the Meeting Agenda Item on Cell Phones. Official document below. “We want you to know how whole families are destroyed by brain tumors,” said Marks as she addressed the Berkeley City Council. The Cellular Telecommunications Industry Associaton legally challenged the measure, saying it violated its free speech rights. Advocates for the Berkeley ordinance say they are prepared for a legal fight. They’ve already enlisted the help of Harvard Law School’s Lawrence Lessig. “This is not about telling people not to use cell phone. It’s just saying here’s the information you should know and make your own decision,” said Lessig, a constitutional law expert. The ordinance could go into effect in July. Next article NEWS 8 Reports One More Sign That Things Are Changing For The Wireless Industry!